If you’re familiar with the nail art technique of water marbling you probably know that although it can produce great manicures, it can also lead to mental breakdowns. If you’re intrigued by marbling but would prefer to skip the consequences to your mental health, the technique known as water spotting is its much easier and less frustrating relative. To prepare for creating your first water spotted design, you will need two polishes, a (disposable) cup filled with room temperature water, a body spray or perfume, and tape. 1. 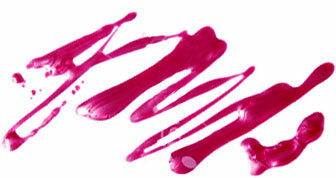 Begin by painting your nails a solid color of your choice and allow it to dry. 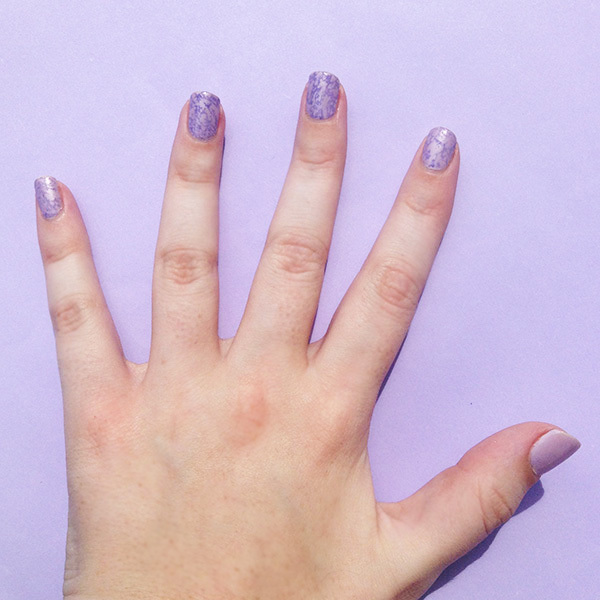 I used Lancôme Vernis in Love in Lilac Love. 2. While your nails are drying, use tape to cover the area around each of your nails. You will be grateful for this step when you finish, as this technique can be quite messy without something to shield your skin. 3. Now take your second polish — I went with China Glaze What A Pansy — and drizzle a few drops into your cup onto the surface of the water. The drops of polish should spread out on their own, creating a thin layer. 4. Before the polish in the water dries, take your body spray (or perfume) and add a spritz or two into the cup. You will see the polish start to break up and form a spotted pattern. 5. To transfer the design onto your nails, dip your fingers into the cup. Carefully remove your fingers from the cup, remove the tape, and then all you have left to do is clean up the edges of your nails and add a topcoat. Easy, right? Once you have mastered the basics, you can experiment with creating different effects by altering from how far and how much you spray, layering different colors, and adding embellishments. One of my favorite options for taking your water spotted nails to the next level is trying a turquoise stone design with metallic accents.